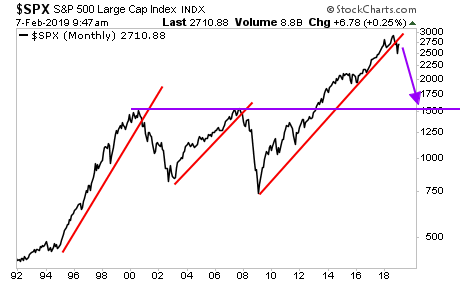 If Everything is Great, Why is the Fed Talking About QE Again? If there was any wonder that something truly horrific is brewing in the financial system, the Fed has confirmed it in the last month. Let’s start with Fed Chair Jerome Powell. Powell took the reins at the Fed in January 2018. From then until last month, he pushed the most aggressive hawkish policy in Fed history, pushing for four rate hikes per year and a QT program through which the Fed would drain $50 billion in liquidity per month. Then, came the January Fed meeting in which, Powell failed to raise interest rates, suggested that the Fed might NOT hike rates again in 2019 AND that it is prepared to adjust its balance sheet normalization or Quantitative Tightening (QT) program if necessary. Put another way, Jerome Powell went from promising four rates hikes in 2019 and leaving its QT program on autopilot to pushing for NO rate hikes and suggesting that it would “adjust” its QT program if needed. All in less than two months. What happened during those months? A crisis started. Now, SF Fed President Mary Daly is out suggesting that the Fed might want to consider making QE (the process through which the Fed prints new money and funnels it in to the financial system) a ROUTINE policy rather than one used solely during emergencies. 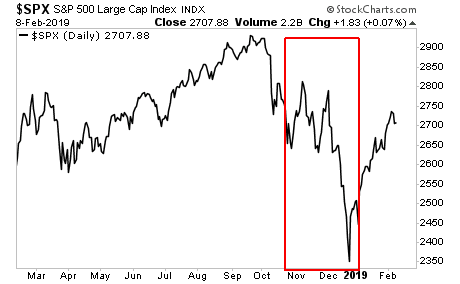 If everything is going great, and there is no risk of another crisis… why is the Fed floating the idea of using EMERGENCY style monetary policies again? What does this Fed see that warrants this kind of panic? Today is the last day this report will be available to the public. We extended the deadline based on last week's sucker rally, but this it IT... no more extensions.